Gambit Movie: Is Daniel Craig Mr. Sinister? Well here's some rather unexpected, but possibly very cool news. Even though the project seemed dead in the water at one point, Channing Tatum is still committed to doing the Gambit movie. Recently, some plot details leaked and revealed (assuming these plot details hold true) that Mr. Sinister is finally going to make his way to the X-Men movie universe. And who might Fox want to play the iconic villain? None other than 007 himself, Daniel Craig. 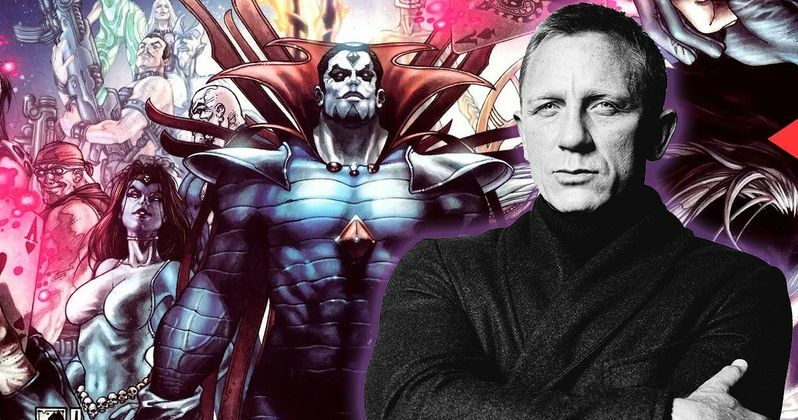 This should be regarded as a rumor for now, but according to Splash Report, Daniel Craig is in talks to play Mr. Sinister in the Gambit movie, in addition to other X-Men movies in the future. That would definitely bring a lot of attention to the project as it would be the first major franchise Craig would be boarding after James Bond 25, which will be his last turn as the iconic spy. Once that movie is done, his schedule is, more or less, a lot more free and clear than it has been during his tenure as Bond. So he could definitely find time to be a villain in several X-Men movies, provided that's what he wants to do. Despite the fact that this casting would be a bit surprising, it does make a good bit of sense for several reasons. For one, Daniel Craig is probably going to want to branch out and do something quite a bit different following his work on James Bond for more than a decade. Playing Mr. Sinister would certainly allow him to do that. Plus, he worked with Channing Tatum, who is playing Gambit, aka Remy Lebeau, on Logan Lucky. Even though the movie wasn't a huge hit at the box office, they do have an established working relationship in a critically-acclaimed movie. It's easy to imagine that is where these discussions could have started. In case you aren't familiar with Mr. Sinister, the character, in the X-Men comics, is named Nathaniel Essex and was born in London. He is a genetically altered human, similar to those in the Weapon X program. These alterations gave him superhuman, physical and mental abilities. Mr. Sinister is telepathic, able to manipulate minds and is capable of energy projection, via telekinesis. He's got a big bag of tricks. He also is very old. The fact that both Mr. Sinister and Daniel Craig are British helps lends credibility to these rumors. There is no Gambit movie release date yet or a director, but it is in development. If the recently leaked plot rumors claim it will involve a huge Oceans 11 style heist, which will be pretty new, as far as the X-Men movies are concerned, if the rumor from Splash Report holds true. Maybe if Daniel Craig does join up, they can talk Steven Soderbergh into directing as well? The guy knows his way around a heist movie. We'll be sure to keep you up to date as more information on the Gambit movie is made available.